Thierry de Montbrial. Action and Reaction in the World System: the Dynamics of Economic and Political Power. Vancouver: UBC Press, 2013. ISBN: 9780774824729 (hardcover, $95.00); 9780774824736 (paperback, $34.95). “At the turn of the century, the international society has no institutions at its disposal that will enable it to impose peace through law” (259) This is a central preoccupation of Thierry de Montbrial, the President of the leading French think-tank, the Institut Français des Relations Internationales (IFRI), in his Action and Reaction in the World System: the Dynamics of Economic and Political Power. De Montbrial has not escaped his countrymen’s proclivity, as heirs to the system of logic of René Descartes (1596-1650), to develop an overall theory to explain the nature of the world order (or disorder). The most prominent twentieth-Century incarnation of this tradition was Raymond Aron’s Paix et guerre entre les nations (War and Peace Among Nations). In essence, what de Montbrial has done is to put together an entirely coherent typology of the world system. De Montbrial brings considerable attributes to his aim of creating a holistic theory of international relations: his long experience in international relations as President of IFRI; an encyclopedic knowledge of history and political science as displayed in this book (and as is evidenced in part by extensive endnotes and an excellent index); and his background in the natural sciences which is not all that common for a French public intellectual. He is a graduate of the one French grande école that is oriented toward science: the Ecole Polytechnique, known for short as “X”. Also, from the University of California at Berkeley, he has a Ph.D. in economics, which is indeed a dismal science in France, as de Montbrial himself acknowledges (220): “With few exceptions, [French elites] have ignored or disdained economics, which they consider to be “ideology” rather than “science” (220). …the “power” of an active unit rests in its capacity to mobilize its “resources” (quotations mine) in order to achieve an objective; its “potential” is the virtual set of objectives that the leader or leaders – the Direction – considers achievable; its “potency” is the combination of this potential and acting out. In the theoretical part of the book (Theory – Part One), the author devotes a chapter to strategy, “which can be thought of as both a science and an art, depending on whether a strategist emphasizes knowledge and method or experience. Its purpose is to give ‘a conscious and calculated character to decisions that are intended to ensure that a policy prevails.’ Strategy is at the core of praxeology” (81). De Montbrial writes: “Conflcts between active units can be decided according to four basic modes: arbitration, negotiation, judicial settlement, and confrontation. At its most extreme (in international relations), confrontation can mean war” (60). According to Carl von Clausewitz (to whom de Montbrial acknowledges his deep indebtedness), wars or conflicts at a certain moment come to a “culminating point” (70). It may not mean the end of a war, but it is at a “culminating point” that one party gives in to the will of the other, “such as the Kremlin’s recalling its ships during the Cuban missile crisis or the “cowardly relief” of Neville Chamberlain in 1938 after the Munich Conference” (70). In the world system of the twenty-first century, de Montbrial foresees the presence of three groups: the United States; the U.K., Germany and France; and the rest. He distinguishes between the United States and the leading European powers: “If the notion of a strictly European culture is problematic, a Euro-American culture is even more complex and undefined” (211). This distinction between the United States and Europe appears in the author’s view to be bound up with the persistence of anti-Americanism, which is “always fanned by the United States’s tendency to use its predominance to impose its ideology in all kinds of ways. More generally it feeds on the inability of Americans to listen” (230). Europe and North America constitute the area of Western civilization built on a Judeo-Christian-Greek-Latin bedrock, along with its references to humanism, rationalism, science and liberty. This area continues to exert considerable power on, and appeal for, the rest of the world, in spite of the stench of neoimperialism that emanates from it (212). What distinguishes international relations…is the insufficiency, but not the total absence, of an external framework. The existing system of legal and cultural constraints that is meant to incite the parties involved to moderate their confrontational impulses is still insufficient…This brings us back to the weakness of international law and its power of enforcement, and the resulting frequency of war and its excesses (73). the extreme complexity and fragility of the international system” (264). The seriousness of this condition cannot be ignored: As we enter the second decade of the twenty-first century, there is no problem more important than determining how to enforce the structural stability of our increasingly complex international system…good governance should allow the structure of the international system to evolve smoothly in desirable directions while avoiding potentially catastrophic bifurcations. How can this be achieved through a combination of collective security mechanisms and global as well as regional balances of power?…The current world is highly heterogeneous – that is, culturally diverse, volatile, and fragile (xiii-xiv). 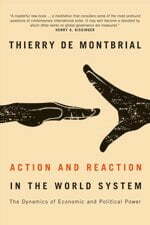 In sum, de Montbrial’s book is a valuable contribution towards a conceptualization of the world system and in so doing assist our thinking as to how it can be better managed and brought under some form of control. Dr. Charles G. Cogan is an Associate at the John F. Kennedy School of Government, Harvard University. A graduate of Harvard, then a journalist, and then a military officer, he spent thirty-seven years in the Central Intelligence Agency, twenty-three of them on assignments overseas. From August 1979-August 1984 he was chief of the Near East South Asia Division in the Directorate of Operations. From September 1984-September 1989 he was CIA Chief in Paris. After leaving the CIA, he earned a doctorate in public administration at Harvard, in June 1992. He lectures and writes in English and French. His fifth book, French Negotiating Behavior: Dealing with “La Grande Nation” (United States Institute of Peace Press, 2003), was published as part of USIP’s “Cross-Cultural Negotiations Project.” A French-language version, with an update, is entitled, Diplomatie à la française (Éditions Jacob-Duvernet, 2005). In recognition of the latter work, he was awarded in November 2006 the Prix Ernest Lémonon of the Academy of Moral and Political Sciences of the Institut de France. In 2007, he was made an officer in the Légion d’Honneur. Raymond Aron, Paix et guerre entre les nations (War and Peace Among Nations) Paris: Calmann-Lévy 1984. Edward Luce, “Lunch with the FT: Michael Sandel,” Financial Times (5 April 2013), http://www.ft.com/cms/s/2/bd509112-9c55-11e2-9a4b-00144feabdc0.html#axzz2WcOlk6gc . The citation is from General André Beaufre, Introduction à la stratégie (Paris: Hachette, 1998). I have a quibble, with a phrase in the book that asserts what has become a sort of conventional wisdom: “…that the…rise of one of the CIA’s protégés, Osama bin Laden provides another example of the unintended consequences of war, and the way the action-reaction mechanism can work in the world system” (77). To my knowledge, no CIA officer ever met bin Laden, and the myth that a meeting took place at bin Laden’s sickbed in Abu Dhabi is just that.